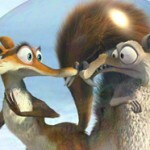 The third “Ice Age” animated film Ice Age: Dawn of the Dinosaurs (20th Century Fox) is shipping today on Blu-ray. Voiceovers come from Denis Leary, Queen Latifah, and John Leguizamo. Rated PG for mild rude humor and moments of peril, the film seems to appeal to audiences both young and old. The 3-disc set also includes a digital copy and standard-def DVD. A triple pack containing Ice Age, Ice Age: The Meltdown, and Ice Age: Dawn of the Dinosaurs has also been released. Battlestar Galactica: The Plan (Universal Studios) stars Edward James Olmos as Commander William Adama in a film that serves well to add more detail to the first two original seasons. The film focuses on the Cylons and their attempts to destroy the human race. This is a single-disc with an aspect ratio of 1.78:1 and VC-1/1080p video format. Soundtrack is formatted in DTS-HD Master Audio 5.1. A vintage high-def release comes in the form of the cult UK television series The Prisoner from 1968. The 17 episodes (full run) stars Patrick McGoohan as agent “No. 6” who resigns from his job but finds himself trapped in “The Village” where those who know too much are kept under lock and key. The tag line “No Man Is Just A Number” may encapsulate this unique and innovative show which debuted in America on CBS in the summer of 1968. The five-disc set is formatted in MPEG-4 AVC/1080p at 1.33:1 aspect ratio. Audio choices include Dolby Digital 5.1 and Dolby 2.0 (the original mono track). Also out on Blu-ray and DVD is Tinker Bell and the Lost Treasure, a sequel to last year’s Tinker Bell, which like the first film skipped the theaters and went straight to disc. Voiceovers are delivered by Mae Whitman as Tinker Bell, Anjelica Huston as Queen Clarion, and Lucy Liu as Silvermist. This is a double-disc set containing both the high-rez movie (formatted MPEG-4 AVC/1080p) and DVD version. For all new Blu-ray Disc Blu-ray Disc new releases visit Amazon.com.